The Social Determinants of Mental Health aims to fill the gap that exists in the psychiatric, scholarly, and policy-related literature on the social determinants of mental health: those factors stemming from where we learn, play, live, work, and age that impact our overall mental health and well-being. The editors and an impressive roster of chapter authors from diverse scholarly backgrounds provide detailed information on topics such as discrimination and social exclusion; adverse early life experiences; poor education; unemployment, underemployment, and job insecurity; income inequality, poverty, and neighborhood deprivation; food insecurity; poor housing quality and housing instability; adverse features of the built environment; and poor access to mental health care. This thought-provoking book offers many beneficial features for clinicians and public health professionals: Clinical vignettes are included, designed to make the content accessible to readers who are primarily clinicians and also to demonstrate the practical, individual-level applicability of the subject matter for those who typically work at the public health, population, and/or policy level. Policy implications are discussed throughout, designed to make the content accessible to readers who work primarily at the public health or population level and also to demonstrate the policy relevance of the subject matter for those who typically work at the clinical level. All chapters include five to six key points that focus on the most important content, helping to both prepare the reader with a brief overview of the chapter's main points and reinforce the "take-away" messages afterward. 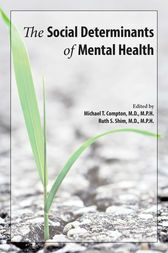 In addition to the main body of the book, which focuses on selected individual social determinants of mental health, the volume includes an in-depth overview that summarizes the editors' and their colleagues' conceptualization, as well as a final chapter coauthored by Dr. David Satcher, 16th Surgeon General of the United States, that serves as a "Call to Action," offering specific actions that can be taken by both clinicians and policymakers to address the social determinants of mental health. The editors have succeeded in the difficult task of balancing the individual/clinical/patient perspective and the population/public health/community point of view, while underscoring the need for both groups to work in a unified way to address the inequities in twenty-first century America. The Social Determinants of Mental Health gives readers the tools to understand and act to improve mental health and reduce risk for mental illnesses for individuals and communities. Students preparing for the Medical College Admission Test (MCAT) will also benefit from this book, as the MCAT in 2015 will test applicants' knowledge of social determinants of health. The social determinants of mental health are not distinct from the social determinants of physical health, although they deserve special emphasis given the prevalence and burden of poor mental health. Michael T. Compton, M.D., M.P.H., is Chairman, Department of Psychiatry, Lenox Hill Hospital, New York, New York, and Professor, Department of Psychiatry, Hofstra North Shore-LIJ School of Medicine at Hofstra University. Ruth S. Shim, M.D., M.P.H., is Vice Chair, Education and Faculty Development, Department of Psychiatry, Lenox Hill Hospital, New York, New York, and Associate Professor, Department of Psychiatry, Hofstra North Shore-LIJ School of Medicine at Hofstra University.